Apart from prostheses (artificial limbs) and orthoses (calipers, braces, splints etc) there is a gamut of other devices which are prescribed for disabled people to carry on with their daily life with least dependence on others. These can be clubbed as self help devices (SHDs). In every issue of the FODDER an attempt has been made to introduce one of the ongoing projects of FOD to its readers. 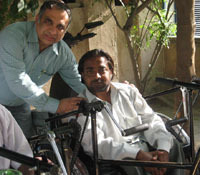 This time the readers are being acquainted with the project where FOD conducts free disbursement of aids and appliances for the disabled people- mainly the mobility aids and other assistive devices for their comfortable daily life. These devices are readily available in the market and can be bought off the shelf any time. Where providing orthoses and prostheses is concerned, the process is lengthy because they are user-specific and made after taking necessary measurements and later followed by repeated trials for which the facility is not available with FOD. 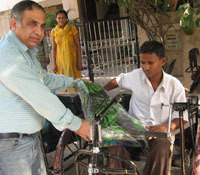 The practice of giving away mobility aids and assistive devices began way back in 1996 when FOD used to refer the needy and deserving people to the neighbouring friendly organistions like Mata Kaushalya Devi Charitable Trust and Bharat Vikas Parishad (B- Block, Janakpuri Branch ), who readily provided the required gadget to the referred person simply on FOD's recommendation. 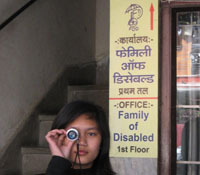 Both the organizations helped FOD in this respect when it did not have any funds for providing disabled people with different gadgetry. 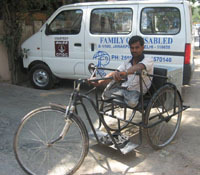 Realising the budgetary constraints of these organizations and convenience of the recipients, from 2000 FOD started providing these gadgets from its meager resources in ones, twos and threes as their was no room to buy and store the gadgets specially the tricycles. As the information spread about this facility offered by FOD, cases from different NGOs hospitals and rehabilitation centers started pouring in and became an almost a daily affair consuming a lot of time in examining each case and completing the necessary formalities followed by raising the required funds. The gadgetry provided by FOD mainly comprise tricycles, wheelchairs (adult/paediatric), walkers, crutches, sticks, hearing aids, iPODs for visually impaired students. 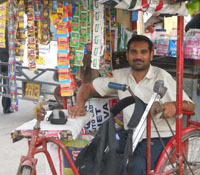 Many disabled people run their micro-trades using tricycles as a sale outlet which saves them from being harassed by police/municipal officials. 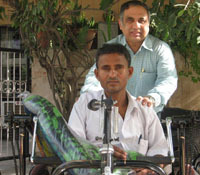 Even in a few cases FOD provided bicycles to individuals with different disabilities to make their commuting economic, comfortable and commodious. Only two visits to FOD are required from any applicant. On the first occasion to get himself / herself registered and complete the necessary paper work which is followed by detailed and thorough verification of the information submitted. Employed persons and students are given preference over others. The second visit is required to get the delivery of the gadget about which he/she is intimated a week in advance. Our record shows that the delivery date, once announced, has never been changed and the applicant has never gone back empty-handed. On the given day all the applicants assemble at FOD office from where they are transported to the venue of delivery, where all the necessary arrangements are made a day before. A recipient cannot apply for any gadget before three years of the previous delivery. Only in case of theft, fire and accident the applicant's second request may be considered before the stipulated period. Cultural programme presented by disabled performers also forms the part of the event on the disbursement day. The community around the venue participates and cooperates actively in the programme which ends after refreshment/lunch (arranged by the sponsors or the management of the venue) is served to all the people assembled on the occasion. To increase disbursement of the gadgets in an orderly manner FOD in 2008 started providing the gadgets to a group of ten or more people at a time from the premises of Mandirs and Gurudwaras of the nearby localities. The urgent cases are considered sympathetically and on merits. Office bearers, members of managing committees of these venues and the local residents extend their full support and help in organizing the event in their locality. During the last two years locations already visited are Bhera Enclave, Hari Nagar, Rajouri Garden, Mansarovar Garden, Narang Colony and Janakpuri, all in west Delhi. The idea behind changing the venues is that more and more residents in different colonies get to know of FOD programmes being conducted for the welfare of disabled people and it also helps reaching out to the disabled fraternity in that area. Organisations like Charities Aid Foundation, RC Malhotra Foundation Trust and Raswant Family Charitable Trust also contribute to meet the cost of the appliances. Many local also sponsor the gadgets for as many applicants as they wish. The date of delivery is decided at least one month in advance to accommodate the necessary arrangements. Sadly, we came across many children with cerebral palsy, muscular dystrophy, polio in both lower limbs, delayed milestones and maladies of similar nature, where inspite of attaining the age of seven to ten years the child was not able to walk and needed to be carried by the parents/carers which is a cumbersome exercise for the carrier and the carried. "We have never been advised or suggested by any hospital/ NGO/institution the alternative means to carry around our child" a general complaint of the parents. When provided with a paediatric (junior) wheelchair they were extremely pleased as they were relieved of the burden of carrying their rapidly growing child whereas they themselves were aging fast. Other gadgets like walker, commode and chair for children with cerebral palsy etc, also provided by FOD assists in managing the disabled child at home and outdoors quite conveniently and is labour-saving. Till December 31, 2010, more than fifty one children have been provided with different types of gadgets and in all, FOD has disbursed 626 gadgets to the residents from Delhi/NCR and neighbouring towns. In the year 2010 alone the organisation disbursed assorted gadgets on five occasions bringing the total number of recipients to 133 in a single year. This event is now being planned for every quarter not exceeding four times in a year. Mr. S.P Dhupar, trustee (FOD), Mr. V.K Anand and Mr. K.B Mahajan, honorary coordinators, have richly contributed to enhance the project of aids and appliances. With their help we expect to target new localities and bring succor to a greater number of disabled people in new habitations, at the same time making the habitants aware of FOD's presence and its projects being run for the welfare of people with disabilities.